Powers/Abilities: Deathlok existed as a human cyborg equipped with a computer CPU that controls his cybernetic systems, which included Deathlok's internal weaponry, life-support systems, power pack generator and bio-neuronic artificial synapse conduits. 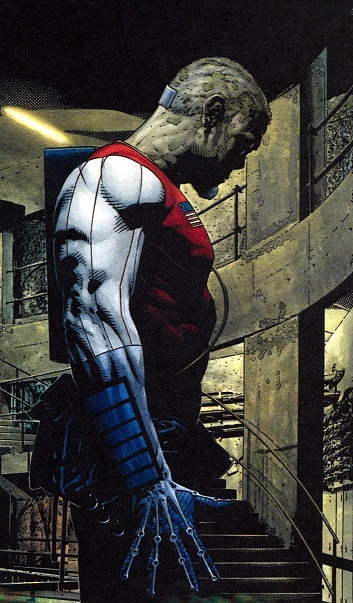 Deathlok's body was composed of 17% decaying organic matter, 36% amniobiotic fluid to preserve his decaying corpse and 47% computer circuitry. History: (Marvel Knights Millennial Visions 2001 - "Who am I?") - Deathlok awoke in his cybernetic body and immediately complained of an intense headache. When his CPU responded that his life signs appeared normal, Deathlok asked who was talking to him before asking who he himself was. The computer responded, explaining all of the various parts that made up the Deathlok cyborg and his status as a living weapon. Panicking, Deathlok began to think he was losing his mind and asked the CPU to explain who he was. Informing Deathlok that he was once a man named Luther Manning, the CPU soon sensed the presence incoming cannibalistic enemies. Deathlok insisted that the CPU continue its explanation of who or what he was and the CPU continued warning him about multiple approaching enemies. When the CPU revealed that Deathlok was actually a clone of Luther Manning, Deathlok became increasingly depressed and the CPU took over Deathlok's form, activating his weapons systems. Comments: Created by Tim Bradstreet. Being a clone of Luther Manning, one can assume Earth-8799's Deathlok has the same height, weight & eye color of the Earth-7484 Luther Manning Deathlok.